s probably time to consult a vet. A University of Barcelona study released in June 2012 found that pain was one of the most likely causes of unexplained aggression in dogs with no previous history of aggressive behavior. If you notice your dog is struggling to move about normally, isn’t eating or appears otherwise unwell, take him to the vet for a checkup. His aggression may well be linked to the pain he is experiencing. This is especially likely if he only becomes aggressive when you touch him or when he has to move. Dogs are pack animals and they’re instinctively driven to protect their pack mates and their home. You may not have noticed it, but something could be causing Lucky to switch into protection mode. For example, that new neighbor who likes to wave as he walks by, a new mailman who bangs the gate as he comes into your yard or the paper boy who comes up to the house rather than leaving the paper in the mail box are all potential causes of aggression that you wouldn’t necessarily notice. Fear is a common cause of canine aggression. Dogs typically give us plenty of warning signs when they are fearful. They hunch, avoid eye contact and lick their lips. But it’s easy to miss the signs. For example, if the noise of that new blender you just bought makes Lucky scared, he could be giving you all the body language warnings in the world, but if you’re concentrating on blending you’re going to miss it. Before you know it, he’s switched from fearful to aggressive. Celebrity dog trainer and behavior specialist Cesar Millan believes that lack of exercise can contribute to aggression, as dogs channel their excess energy in negative ways. If you’ve recently taken a new job or have some other reason for altering your routine, which means Lucky isn’t getting the same amount of walks, this may be the cause of his new aggression. 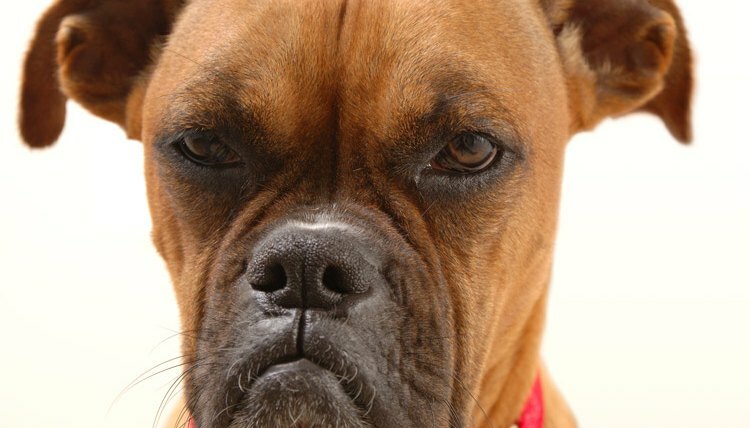 The presence of a new dog or person in the house may cause a previously friendly dog to become aggressive. Especially if that person or dog is not used to dealing with dogs. Dogs are typically adaptive and will accept change quite easily, but if the change brings with it a source of large disruption, your dog may build a negative association with the new person or animal. For example, the whole family knows not to disturb Lucky while he’s eating, but the new dog or house guest may not observe this courtesy. A new dog may sniff Lucky’s food or the new person may innocently pet Lucky as he walks past. These seemingly innocuous incidents can cause Lucky to switch into resource guarding mode. What Happens to the Old Wolf Pack Leader?